Here is a great example of putting together a great partnership offsite event. This partnership is with Home Depot in Concord. Ryan Stone teamed up with the Commercial Desk Manager at The Home Depot which is a few blocks from the dealership. There are two Home Depot's and a Home Depot Expo Design Center in Concord. 1. Create a partnership theme with Home Depot with a specified budget for giveaways that will be purchased each week at that Home Depot. Ryan's budget is $500 per week which allows him to buy some nice quality tools and things to give away each week. Of course, since he buys them at Home Depot each week, so the manager knows what is in it for them. You notice in the photo some premium brand products--none of the cheap giveaways--just good quality items. He changes the items each week according to his desires and perhaps with some input from the Home Depot manager of items they may be focusing on or things they want to move. 2. Make sure and partner further by offering to put Home Depot credit applications or whatever Home Depot may want to promote that week. On the table in the photo is some Home Depot Credit applications. 3. Have forms for entry into the giveaway and allow a business card to suffice as entry. Make sure all items are given away each week. 4. Have lots of brochures stamped with dealership name with business cards attached and ready for action. Have a table, a tent, a display vehicle (different vehicle each week). 5. Give away free coffee and/or rolls. The best thing is to partner with the vendor that sells coffee at most Home Depot's. Work a deal with them, so that you give out a ticket and the customer just hands that to the coffee vendor to get the coffee. At the end of the event, you pay the vendor the agreed price based on the number of tickets they have. Not a good idea to bring coffee in from the outside--create partnerships! 6. Be enthusiastic no matter how you feel and be animated. Get people feeling good. Draw them to you. The drawing is not enough. You must draw them to you. 7. Follow up each and every entry with a great letter and flyer about the dealership. Add each name to your golden database and keep following. Announce the winners. You might even post a list of the previous many weeks winners at your table at the event. 8. Make it real. Make it fun. Do it through a partnership. It is win-win-win! Do it well. Clean up after you leave, be respectful. Do it often. A regular weekly event. How cool is that? Great job Ryan! Keep up the good work. In five weeks (as of 11-21-07) he has generated over 175 good prospects to follow. And, he gets to talk to each one in person! Making it happen instead of waiting for it to happen. So what if the market is down or off. When it comes back, Ryan is going to be in the right place at the right time. Already several quotes and some sales in process. Luck is preparation meeting opportunity. Bravo! 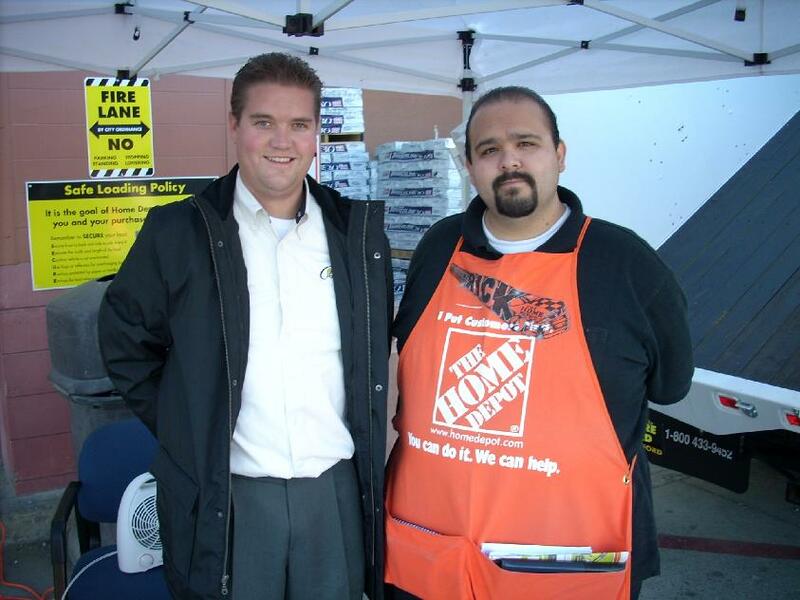 Ryan Stone, Commercial Mgr and Rick Perez, The Home Depot Commercial Desk Mgr = Great Partnership! Great high quality prizes each week! Nice display table! Plenty of brochures in box on ground. Bill and Ryan hard at work! Great little short time-frame, highly productive event! What's that Harbor Guy doing in there? This column will have an interview with different commercial managers who are willing to share some of their successful actions. Since this is the initial uploading of this website and there hasn't been time for an interview, I will add what I felt were key ingredients in my success at selling commerical trucks in as few words as possible. The first thing was I had a vision of what I wanted to see when the thing was built. I envisioned a stand alone dealership with nothing but commercial trucks, pickups, vans and a service department with the same focus. I saw it large even though I started with only one service body (a Harbor, by the way. . .). With that vision, I decided I needed a database of potential customers to market my products to. So, I bought the best database I could find. It was pricey, but it generated a $100,000 return on investment in the first six to eight months and we never looked back. I bought it by county and started with my own county and expanded to all surrounding counties and a few more that I thought were great markets. That's the greatest thing about the commercial market: it is a regional market, not a local market. If I build it big and take the best care of customer, people will come from far and wide to take advantage of our offerings and service. We delivered vehicles 500 miles away on a regular basis. That's hardly a local market. Third, we focused on prospecting. We had no lot traffic and were buried in the back corner of the lot. The database provided a great starting point. I gave my salesmen a list from the database and they returned information and I updated the database as if it were solid gold. I used the same list for 10 years and it just got better and better. Fourth, I was willing and interested to stock a number of items that are "outside the normal box." I call it specialty inventory now, but I really got off on trying new things that I could get excited about and get my team excited about. People can get the standard stuff anywhere, but a lot of my pieces were one of a kind and they sold very nicely thank you--with great grosses. Show a customer a new and different way of getting something done and they love you. Fifth, I had written plans that I shared with the dealer and I kept really detailed records so I could demonstrate what we were doing to benefit the dealership. I got so good at reports! The dealer just kept letting me do more and more. I had regular planning meetings with my team as well. Sixth, the focus was always on growth. My philosophy was that if a business is not growing, it is dying. How many times I have heard that phrase! Much of the time, I scoffed at it. That's why wisdom takes time--it's an aquired thing--a cumulative thing. I now can say that I have some. . . just some. It came from personal experience and from watching and, yes, listening to others. In this regular column, I will impart a bit of what I think has become wisdom to me and how it might benefit you . . . if you are open to it. If you find a good bit that you can use, go use it. If not, perhaps you can use it in the future. You never know when a good idea will change your life. I just love those. I call them plateau busters. They just move you right through because your thinking has changed. Of course, that is all there is: how you think about things, people, events, yourself, life. And in this, you get to choose and only you. As in the Raiders of the Lost Ark series, I don't want to be the one who it is said of, "he chose poorly." I have learned to learn from everyone and learn constantly. To me it is growth and life. Below is the most current edition and other editions will be added continually and saved under the page, Article Archives. You've most likely heard the phrase, "going to Plan B." It means your first plan, Plan A wasn't going according to plan, so you had to improvise and go to Plan B. This is a very common thing, but some people get quite upset when it has to be used. I was one of them. Something changed about 9 years ago that caused me to look at this differently. I'm not real clear on what it was exactly, but I think I just decided to stop getting upset about minor things. It has taken most of my life, but I don't swim upstream very far any more. I like going with the flow. It's peaceful and calm--and effortless! I've learned to go to Plan B as if it were just part of the flow of the river. I used to play music and lead a group in church and choosing the right songs was my pleasure and responsibility. I would spend a lot of time in that area and then go to the church to play and something would change like a special singer not showing up, or an instrument now missing that was key to the song, etc. If you are playing Rock style music and the drummer doesn't show up, that is definitely a Plan B. This kind of thing happened so many times, that I started choosing the "A" list and the "B" list and carried alternates with me at all times. I got so good at going from Plan A to Plan B to Plan C that it was darn near seamless. In the beginning it was frustrating, but what is the point of that? It certainly doesn't help. What is, is. I just let go and started flowing with it. What a change! No big deal. So many times, Plan B became so good you would have thought it was a well rehearsed Plan A.
I started using that philosophy and attitude with my job and at home and it worked there just as well. Things that used to make me upset, no longer even seem like a bump in the road. Calmness prevails. I use it talking to clients. A customer wants a loaded XLT Crew Cab 4x4 in Red with a dually Service body. Good luck finding that truck in the pool! But dealers will call me anyway to ask. I just go to Plan B immediately and suggest they look for a series of compromises that will do a similar job unless the customer is ready to wait for an order. A great compromise here is a similar model pickup where we can take the bed off and put the Service body on instead. Problem solved! There should be a number of those trucks available. Now I have Plan A, B, C, D ready and waiting in the wings. I want to close deals and this is the way to close more of them. Be prepared with your product knowledge on how to compromise to solve the customers problem and close the sale. Knowing what you need to know, means that in this case, you would immediately go to Plan B without spending even more than one question on Plan A and that question would be, "Are you willing to wait 10-15 weeks to get your truck?" If the answer is no, I'm on Plan B now and I've got Plan C and D waiting. There are quite a number of alternatives in this case. It just comes down to the customers desire, their willingness to be flexible to help solve their own problem. This is where the knowledge matters. I highly recommend knowing. I have helped my clients close many, many deals with this knowledge and flexibility. I make these suggestions and listen. As I said, I don't swim upstream very far anymore. After I offer the suggestions and get arguments, I relax and let go and float back downstream. I recommend doing the same thing with your customer. Sometimes you want the deal so bad, that you lose perspective. You would be surprised to see what happens when you just relax and stop swimming upstream. The customer may not really want a solution meaning that they are not flexible. Okay. No big deal. If they really have a need, your Plan B, C, D will impress them that you know what you are doing. Selling is only hard when you are trying to sell someone who doesn't want to be sold. There's no fun in that, but your knowledge and intuition will help you determine what is needed and when. Develop the flexibility by developing the knowledge of your own product so you can know what Plan B is. Plan B? No problem! Plan C? No problem! Knowledge is the key! Wisdom taught me this a long time ago. I remember in my early twenties hearing that to be a life-long learner was the best advice. By and large, I have accepted that premise and found it to be of infinite benefit to me. When I was in school, I didn't read more than necessary. It was not until I left school that I really started on my learning path. Getting into Auto Sales at the age of 22 with a manager who was a learner helped me so much! I got into sales in 1972 and back then it seemed very difficult to find books on sales. Now, there is a plethora of them to wade through. I remember going to the public library and looking in the card file (remember those?) for anything on sales. Luckily, I ran across one that has been powerful for me and I have given so many copies of it away over the years. It was a book by an Insurance salesman named Frank Bettger (Bet-Cher) and it was titled, "How I Raised Myself From Failure To Success In Selling." It is still a powerful book. In recent years I have a small online book business on eBay and I have secured several rare copies of Frank Bettger's books that are signed by him worth hundreds of dollars each. A little fun for me. If you have never read it, I highly recommend it. It is very easy to read and is especially good for a salesperson who is struggling in that new career. The manager who hired me also had a number of motivational 33 1/3 record albums (this was before cassettes even). I remember listening and taking copious notes, then listening again and again. One was called "The Strangest Secret," by Earl Nightengale. Another was by the legend, J. Douglas Edwards, whose famous line is, "after asking a closing question, SHUT UP!" And, it was so powerfully presented on that record. And, I used it! And, it works like magic! Another, I remember (since 1972. . .) a guy talking about 1/4" drills and him saying that people don't want 1/4" drills, they want 1/4" holes. Now that might sound too simple, but if you really think about that whole thought and carry it further, it will become extremely powerful for you. Truly. Another I remember this anecdote: "There are only 3 jobs in life: 1. Filling the things that are empty. 2. Emptying the things that are full. and, 3. Scratching where it itches." I have used that since 1972. It is great and so true. I remember them talking about quality and how important that is. I remember different sales skills they were trying to teach that are with me today. One I always seem to keep in mind was a real estate person was showing a house, but prior to showing the house, they took the time to find out what was important to the clients. One little thing that was learned was that he liked trees. As the realtor was showing the house and the client was balking at the price a bit, the realtor pointed to the trees and said, "just look at all those trees. . . there's one, two, three, four. . ." That has always helped me to remember to remember what is important to the client and not me. It's always about that for successful salespeople: focusing on the client and their needs and desires. Forget about the commission or what you want because it doesn't matter. At the same time, it helped me remember to help keep the customer focused on what they want and not what they might be afraid of. Reminding them of their own desires can be very powerful and help you close many more sales. I remember also the only record set that was about auto sales. I can't remember the name now, but I just loved listening to his voice and his messages. He was powerful. There are a number of things I remember from them. One I use in my training classes today and he called it "taking a lemon and making lemonade." How it was presented was this: a salesperson was delivering a new vehicle to a customer and going over the operation, manuals, etc. and in the process he looked down and noticed the car didn't have a heater (yes, that was an option back then) and he realized that the subject never came up, so the heater was never discussed. He also realized that if he didn't handle that right now, that there would be hell to pay if the customer got home and noticed it didn't have a heater. So, he tells the customer, "Mr. Customer, you know if you ever want a heater installed, I will get you a good price in our service department." The customer looks down, but because of the way it was handled, the customer realized that it had never been discussed, and he says "okay." You might imagine what would have happened otherwise. This is taking a lemon and making lemonade. I have used this concept in so many ways throughout my life. I use it in teaching Commercial Truck Sales now and it is powerful now as it was then. I could go on. The point I want to make is that I took the time to learn from a record, a book, a tape, whatever. I retained a portion of it. I am sure there is so much that I cannot ever remember, but that is not important. It is what you do remember that is important. And, when you add one on top of the other again and again, you gain knowledge and wisdom. How cool is it to remember these specific things from 35 years ago. I'm not even discussing the hundreds of books, tapes, seminars, etc. that I have absorbed since then. A powerful idea will stay with you and if you use it, it continues to be fresh as if you learned it today. At a much later time in my career, I was commuting 52 miles each way to work and made effective use of that time in what was my "university on wheels." I read 118 books on tape during that time and many of them more than once. I remember so many tidbits from those books. Here is one of the most powerful ones I remember that helps me help managers and dealers today. It is from the Autobiography of Andrew Carnegie. This is a very powerful book to read if you haven't already. Anyway, Andrew Carnegie was one of the largest producers of steel and one of the richest men on the planet around the turn of the last century. In his business growth at the early stages of steel production, there were numerous changes in design and improvement in technology of creating better, stronger steel. During the time he owned the steel business there were also very volatile and numerous economic recessions and expansions. Andrew Carnegie always set aside funds to take advantage of the recessions by investing that capital in improving his operations at a time when the business climate was poor. This gave him several advantages. One, he kept his people working. Two, He improved his capacity and even more importantly the quality of his expanding capacity and, three, he took full advantage of the bargains in the marketplace in the recession and when the recession turned back to expansion (as it ALWAYS does), he was in a perfect position to capitalize in a large way on the expanding business and his greater capacity to meet the demand and command premium pricing for a much improved and superior product. How brilliant! The more I thought about that after reading this several years ago, the more powerful the idea has become. How I use this concept now is that the slower time is the time to make even more investment in your people and procedures and your database and improving your business. When it is busy, busy, busy, there is no time, no time, no time to think of such things, let alone do them. It is a cyclical business. So go with it. Don't panic--Prepare! Don't worry--get Excited! There is always a way to take advantage! Build the foundation now while there is time and energy to do it well. When the lumber arrives, the structure will go up overnight! You will own the market because you planned and prepared and expanded your capacity to be more effective AND profitable. There is a future, it will be good, so let us prepare to take full advantage of its blessings right now. Finally, the most recent learning has sort of brought me full circle but in an expanded way. I have come back to "The Strangest Secret" and "Acres of Diamonds" "How I Raised Myself From Failure To Success In Selling" and so many others that I learned from 35 years ago. It is all about thought. Thoughts are things. There is only one true thing that I can control. It is my thoughts. No one can think for me. I can learn from others, but no one else can think for me. How I think about things determines the results in my life. I have had plenty of time in my life where I have wandered away from this and saw the results. I am back with a vengeance. I am never going away again. I can control my destiny, my results simply by how I think. Here is a great quote I just read in his great book, "How To Have It All" by John Assaraf. It is powerful and simple and true as true can be: "Happiness is a personal choice and not the product of anything external. Material things don't have the power to make you happy. They can give you comfort and enjoyment, but not happiness. Instead, you must make the choice to be happy. You may not like some of the events or circumstances going on in your life, but the choice to be happy is yours. It comes from the inside, so you have complete power over it and can make this choice at any time." Of course, you can substitute the word thought for the word happiness. What got me back on track in such a powerful way was a book called "The Secret" by Rhonda Byrne. It takes all those things I learned at age 22 and beyond and puts it all together into a package that makes it so easy to keep in my life. Very powerful book. It is also a DVD and my favorite is the audio book. In all my wisdom (or time), this book is a catalyst and it has been for many millions of people as well. It has changed me powerfully by showing me that the results I have been receiving in my life are totally and 100% my own fault. That's right. I created it. It didn't matter that I didn't fully know what I was doing, but I have learned to accept responsibility for it totally. I am in control. Which means that the only thing that I can really change is what I have control of, so I change my thinking, and I get different results. That is unquestionably the most powerful thing I have learned. Everyone makes use of it everyday, but most don't understand the cause of the effect. They look outside themselves for the answer when it is inside, not outside. Don't like the results? Only one thing will change them: change your thinking. Visualize a different result. Focus on it and always think positively toward it. When someone starts talking about how bad things are, etc., I change the subject. I don't want to hear that. I can't hear that. It's not true for me. I won't allow it to be. They can have all of it they want, but I want none of it. That is how to get what you want: focus on it. Focusing on what I don't want will only bring it closer to me. Don't want none of that. No sir! Outa here! There is nothing more powerful than knowing what to do to change your circumstances. Think about it! So, would you like a Doctor who goes to school, gets his license and never studies his chosen field again? I know that I would prefer they study regularly and with great interest. In sales, there is a tendency to learn a few basic things, and study very little from then on. I predict it will show in the growth results. My words of wisdom is to accept the challenge to life-long learning. To study your field with the goal to be the best that is possible for you to be. It will not cost you, it will pay you--handsomely. Do you want to sell more cab-over trucks or the so-called LCF? During the time I was in sales we carried the Isuzu, UD, and Ford franchises at our dealership. Ford did not have an LCF at the time. Since my job was to sell primarily UD and Isuzu trucks one of the easiest ways I found to sell an LCF with nearly 100% success was against the Ford or Chevy Cutaway van. Not only did the customers switch over but, when they realized it was a superior product they never switched again and continued to come back to buy more LCF�s. Whenever, I had a prospect call in or inquire about a Cutaway, I would make an appointment and have the prospect come out for a test drive. Before the prospect would arrive I would find a Ford E-350 Cutaway and park it in the center of an Isuzu line up so that the Ford would stand out as being different. Then on the end of the line up I would take an Isuzu with same 14� or 12� body and tilt the cab. By this time you can�t help to notice that the prospect�s curiosity is starting to get the best of him. He would usually start off by asking what is an Isuzu or a UD or why do you only have one Cutaway. I would say, �These are cab-over trucks and this one over here with the cab tilted has the same size body as you are test driving on the E-350. �Notice how easy it would be to work on one of those engines. On the test drive in the Cutaway, I would direct the customer onto the freeway. As we increased to freeway speed the noise from the engine compartment, the crawl-through door, and all the rattling of the van in back would get annoyingly loud, and I would apologize for all the noise the truck was making. Customer might say something like, �My older truck is noisier.� My response would be �wow�, and then inquire why he is getting another one, or is his old truck going to be a trade in. Remember that, it is very important not to bad mouth the product as you are still selling the Cutaway. When the test drive is over, immediately open the hood, to show off the engine compartment to your prospect. Show him how all the fluids are easily accessible even though you can�t see the engine. At this point tilt the cab back and open the driver�s door and show off the roomy cab and the standard tilt and telescoping steering. Test drive is absolute to selling this truck. Do a short one if time is running out. I might say, �You know I am primarily a Ford guy but, these cab-over trucks are really getting popular and I think you should take a test drive.� As soon as he is strapped in you need to have him do a U-turn on a residential type street, point out how quiet it is, stay really excited about how the truck is handling and when you return to the dealership ask, �What did you think?.� If he says he likes it, you have just closed another LCF deal. All LCF�s essentially are very similar so, if you know one make such as Isuzu, or the Ford LCF you know them all. I would think that if a customer wanted a diesel E-350 Cutaway you could easily show the advantages Ford LCF. Let me talk a bit about "the right tool for the job". When business gets a bit more challenging, you tend to notice it a bit more, but it's right there all along. When a customer visits your lot, it is important that you make a good first impression. I'm sure that every one of you will agree. We want our salespeople to be knowledgeable, more knowledgeable than any other dealership. We want him to know features, benefits, availability, or lack of availability, market trends, capacities, the list goes on and on. We train them, the factories have "Certification Classes", new product launches. We are cutting edge, right? Why then, would we allow a salesperson to "up" a commercial customer without the proper knowledge to perform a proper fact finding interview? A number of things might happen and a couple of them may happen at the same time;You might sell the customer the wrong truck, misquoting capacity and serviceability, putting the dealership in a tremendous liability position, not sell the vehicle at all because you didn't have the proper knowledge of incentives, availability or options, or lose the customer forever because he was not ready to buy "NOW". That is why I believe that all commercial customers be directed to a knowledgeable, trained and successful Commercial Truck Salesperson. They work this program everyday. They know that most commercial customers may take weeks, months, sometimes years to conquer. They have been following up with such customers their whole career, have seen the fruit of their labor produce that way time after time. Why then would we allow an untrained retail salesperson to attempt to work a deal on a commercial truck? Greed, laziness, ego? Maybe. Maybe all of the above. If you were to calculate how much lost revenue is involved by losing just one medium sized construction company, you might think differently. The losses can be measured in the 10's to 100's of thousands of dollars in a lifetime!! Each and every one!! Perhaps millions of dollars in each dealership over the course of your careers. Think about it... 4-5 deals per month @ $2500 each over a 25 year career is nearly $4,000,000! !